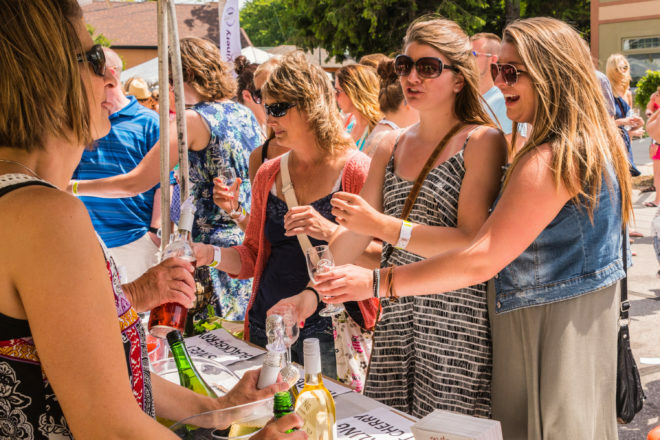 Summer is officially here and with it comes the third annual Door County Wine Fest on June 30 at Martin Park, located at 207 S. Third Ave. Enjoy the beautiful weather and waterfront view in downtown Sturgeon Bay. Savor unlimited tasting of award-winning Door County wines from eight local wineries, paired with complimentary cheese and relaxing music. Grab your friends, head to the wine bar and purchase a glass of your favorite wine to enjoy while you listen or dance along to Black n’ White, a reggae band out of Milwaukee. Pete Honzik, an acoustic contemporary rock musician, entertains in the bar area. Local restaurants and food vendors sell food dishes and hors d’oeuvres throughout the event. A wide variety of food is available including sushi rolls, gyros, samosas, pizza, antipasto skewers, burgers, brats, fresh battered cheese curds, scones, cookies and more. Food is available starting at 12:15 pm. Ticket gates open at 12:15 pm and the tasting tent opens at 1 pm. Tickets are available online for $30 or at the event gate for $40. For more information and tickets visit doorcountywinefest.com.